IBA provided more home loans in the past financial year than ever before. The journey to home ownership isn’t easy, it takes planning, budgeting, forward thinking and commitment. IBA has created a budgeting workshop to support Aboriginal and Torres Strait Islander people and their families to better understand the financial responsibilities of buying a home and taking control of their money. IBA’s budgeting workshops are for those interested in applying for their first home loan, but also for existing customers who are interested in learning how to be smarter about their money. A recent Deloitte Access Economics study surveyed over 1000 people who had been through the IBA home loan program and found that nine out of ten reported improved living conditions, self-esteem and overall happiness. Participants attending the budgeting workshop will cover topics like understanding the customer’s money story (beliefs, attitudes and values regarding money), developing a money plan, setting goals, preparing for the costs of home ownership, and providing resources for further advice. Deputy CEO Wally Tallis says, ‘IBA goes further than providing money and works hard to ensure our customers are equipped with the skills and processes of owning a home in order to give them the best chance to succeed. One of the barriers customers identify is financial literacy and budgeting. ‘IBA now provides the opportunity for these customers to attend a budgeting workshop to put the tools in place to be better positioned to manage the costs of owning a home. ‘The lack of intergenerational wealth is a big barrier to home ownership for many of our mob. If we can get people into their first home and keep them there with the right budgeting behaviours, then it sets them up on a positive path for their future. Carmen and her daughter picking up their keys to their new home. Carmen Cubillo is a Larrakia and Wadjigan woman living in Darwin, Northern Territory. Her story to home ownership is three times the charm. Carmen’s first attempt at home ownership was when she was quite young and IBA agreed to provide her a loan, but she decided it wasn’t the right time for her. Then when she tried again six years ago, she was unsuccessful due to barriers in her financial situation. In October 2018, Carmen was on her third attempt to get a home loan. While waiting for an invitation to apply, Carmen took the opportunity to attend one of IBA’s new budgeting workshops. When attending the workshop Carmen thought she knew all she needed after successfully getting herself out of debt. ‘I walked in pretty confident. And walked out with a list of things to help me. I learned all this stuff that really helps me now. Carmen says that it’s important to understand the financial responsibilities of owning your home before putting in an application. ‘They gave us the real deal – what it actually costs when you have a house. Plan for this, plan for that and don’t leave this to the last minute…The workshop was just really valuable in saying that these are the day to day costs of having your house. ‘Don’t get all romanticised about getting the loan. The loan is not the issue. It is the everyday costs after getting a loan. ‘You don’t think about it when you’re younger, you just kinda think that you’ll earn money and it will be fine. But it’s not going to be. Whatever you do now with money, affects you for the rest of your life. ‘You can see budgets any way you like. But the reality is if you don’t have enough money you need to reorganise things so you do. 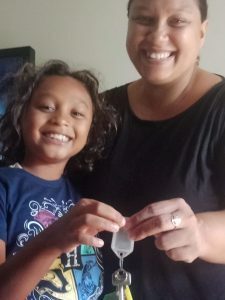 In January 2019, Carmen and her 8-year old daughter moved into their first home. Now Carmen and her daughter are living in their own home with a pool. She still follows a strict budget and knows that every cent needs to be accounted. ‘It’s the best thing that ever happened. ‘It just means the world to us just to have our little patch of land. It’s not the flashest house, but it’s ours.